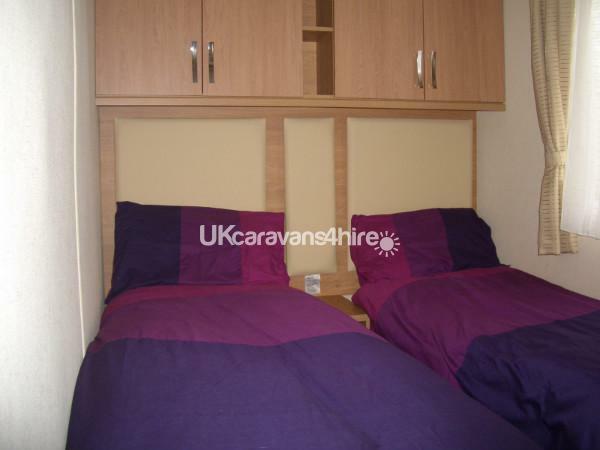 Either a £50.00 or £100.00 non-refundable deposit is required depending on the time of year. We will confirm which on enquiry. 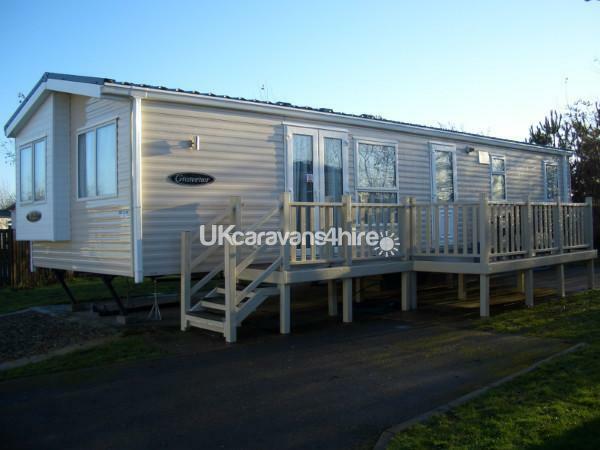 The caravan is situated on the lake hill area of Primrose Valley. It is in the middle of the holiday site, but, as the caravan is in a cul de sac vehicle noise is to a minimum. We allow a maximum of 2 pets at £10.00 each. 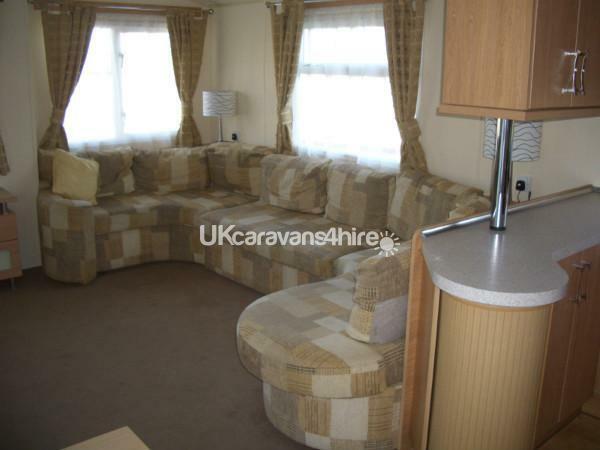 This is a luxury 8 berth caravan, Consisting of 1 double bedroom and 2 twin bedrooms and a pull out sofa bed in the lounge. 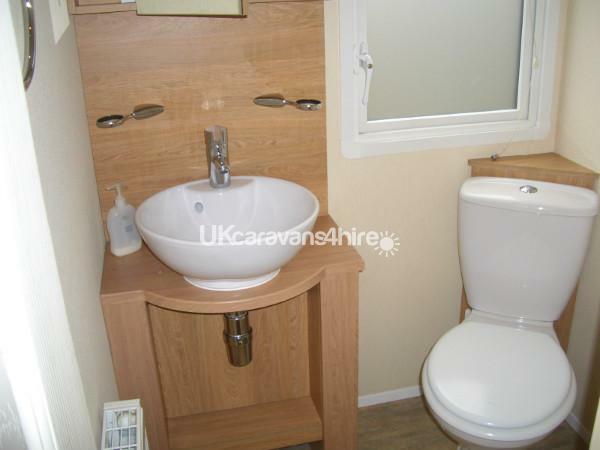 The bathroom consist of a separate toilet with hand basin and next door is the walk in double shower and hand basin. The kitchen is fully equipped. 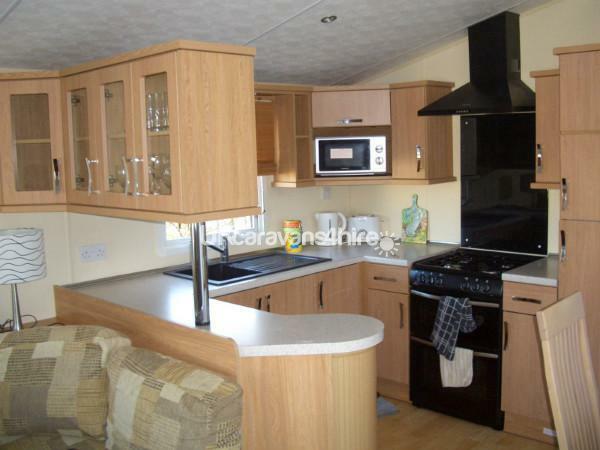 This includes: kettle, toaster, fridge-freezer, gas oven and hob, microwave and crockery and cutlery. The wide spacious lounge consists of ample seating for 8 people with a seperate dinning area. The lounge has a 24 inch LED flat-screen TV, with a built in DVD player. There is also an electric fire in this open space area. 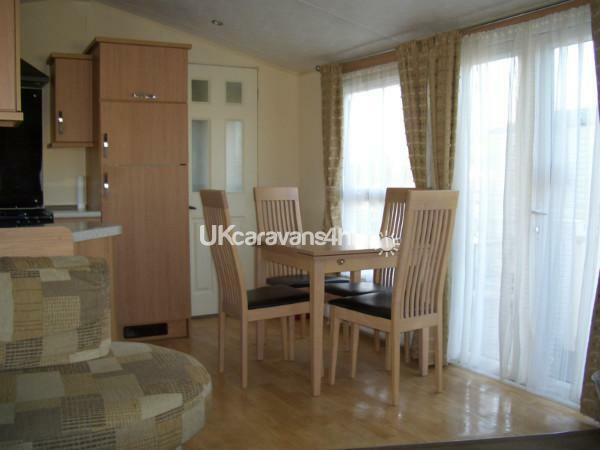 The dining area consists of a free standing table and 4 dining chairs. 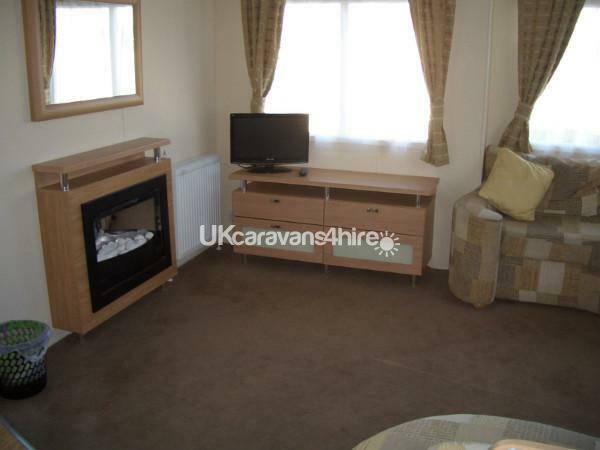 This caravan benefits from central heating and double glazing throughout to take the chill out of those cold spring and autum evenings. Outside there is a veranda, complete with a gate and is accesible from the patio doors. There is bench seating on the decking to laze away those sunny days. There is off road parking at the side of the caravan. 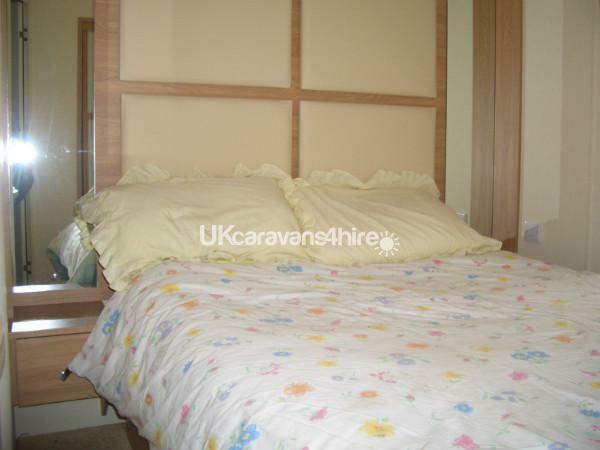 In the hiring of the caravan bedding is provided free and made up on your arrival. Also the gas and electric is free of charge. Essentials such as towels, tea towels, toiletries and toilet rolls to be provided by yourselves. 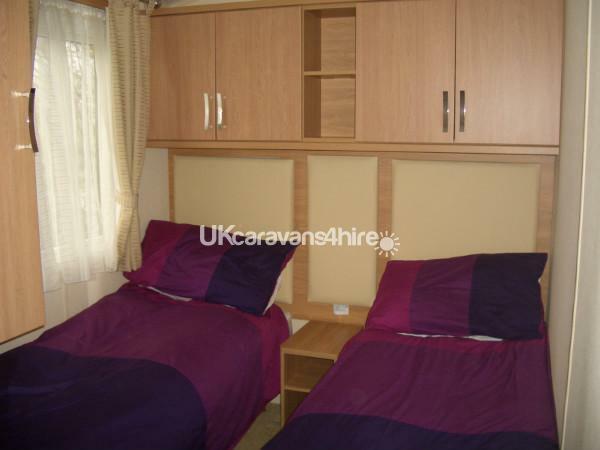 This caravan is available on a weekly basis from Friday to Friday but other dates could be available where possible. This will be available from 3.00pm and departure time 10.00 am. Depending on the time of year, either a £50.00 or £100.00 non refundable deposit secures your dates. We will confirm which is required on enquiry. Please pay the outstanding balance 8 weeks prior to the start date of your holiday . We do not include passes to any of the Haven facilities. These can be purchased from the site reception. Additional Info: Passes are required for the amusement arcade, swimming pools, and the 2 night clubs. One of which is child friendly with shows and competitions. On site Pappa John's pizza, West Pier Hand made Burger Bar, Mash and Barrel pub which serves food and fish and chip shop where you can eat in or take away.